For facts and figures on Colchester click on history. 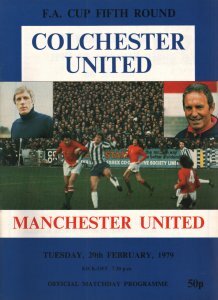 66/7 Reading £1.50; 67/8 Shrewsbury £1.50, Torquay (FAC) £1.50, Tranmere £1.50; 74/5 Southend; 75/6 Chesterfield; 76/7 Bournemouth, Derby (FAC), Doncaster, Exeter, Torquay; 77/8 Hereford, Lincoln, Preston, Shrewsbury, Walsall; 78/9 Chester, Chesterfield, Exeter, Gillingham, Hull, Ipswich/Norwich (Willhire Cup £1.20), Lincoln, Man Un (FAC £3), Mansfield, Rotherham, Shrewsbury, Southend, Swansea, Tranmere, Walsall; 79/80 Exeter, Rotherham; 80/1 Blackpool, Brentford, Charlton, Chester, Exeter, Fulham, Gillingham (LC), Hull, Oxford, Plymouth, Reading, Rotherham, Sheff Un; 81/2 Aldershot, Bury, Crewe, Mansfield, Northampton, P Vale, Rochdale, Stockport, Torquay, Tranmere; 82/3 Aldershot (LC), Crewe, Hereford, Mansfield, Stockport, Torquay; 83/4 Chester, Hereford, Rochdale, Torquay; 84/5 Aldershot, Exeter, Northampton, Peterboro, P Vale, Scunthorpe; 85/6 Burnley, Crewe, Mansfield, Peterboro, Preston, Southend, Tranmere, Wrexham; 86/7 Halifax, Hartlepool, L Orient, Lincoln, Peterboro, Peterboro (LC), Preston, Rochdale, Scunthorpe, Swansea, Torquay; 87/8 Cambridge, Exeter, Fulham (LC), Halifax, Hereford, Hereford (FAC), Peterboro, Scarborough (first league season £2), Scunthorpe, Stockport, Swansea, Torquay, Tranmere; 88/9 Doncaster, Exeter, Halifax, Hereford, Hereford (SVT) £1, Lincoln, Northampton (LC), Rotherham, Scarborough £1, Scunthorpe, Wrexham, York; 89/90 ('last' League season) - see below ; 92/3 Brighton (LC), Bury, Carlisle, Chesterfield, Crewe, Darlington, Doncaster, Gillingham (FAC), Halifax ('last' season), Hereford, Northampton, Northampton (SVT), Scarborough, Scunthorpe, Shrewsbury, Torquay, Walsall, Wrexham, York 55p; 93/4 Bury, Fulham (LC), Lincoln, Northampton, Rochdale, Scunthorpe, Shrewsbury, Walsall, Wigan; 95/6 Chester, Hereford, L Orient, Lincoln, Mansfield, Preston, Scunthorpe; 98/9 Notts C.
FRIENDLIES & TESTIMONIALS (at Home) – 92/3 v Nessegutten/Stranda. v NON-LEAGUE (at Home) – 88/9 v Bury Town; 89/90 v Rainham £1. ‘LAST’ LEAGUE SEASON Homes - 89/90 v reserves v Welling; Eastern Junior Alliance v Wivenhoe. NON-LEAGUE Homes - 90/1 v Barnet £2, Bath £1.50, Boston Un £1.50, Cheltenham £1.75, Fisher £1.50, Gateshead £1.50, Kidderminster £1.75, Macclesfield £2, Northwich £1.50, Runcorn £1.50, Runcorn (FAT) £1.20, Telford £1.50, Welling £1.50, Wivenhoe (FAT) £1.20, Wycombe £1.75 (marked copy 50p); 91/2 v Bath £1.50, Cheltenham £1.75, Stafford £1.50. at ALDERSHOT 74/5; 81/2; 85/6. BARNSLEY 80/1. BIRMINGHAM 70/1 (LC). BLACKBURN 77/8 (LC). BOURNEMOUTH 74/5; 99/00. BRENTFORD 76/7; 78/9; 79/80; 80/1. BRIGHTON 96/7; 97/8; 03/4. BRISTOL CITY 04/5. BURNLEY 80/1. CAMBRIDGE UNITED 81/2 (LC); 87/8, 87/8 (FRT); 89/90 ('last' League season); 95/6; 97/8; 00/1. CARDIFF 86/7; 92/3; 95/6. CARLISLE 87/8; 88/9. CHARLTON 78/9 (LC). CHESTER 78/9; 79/80; 82/3; 83/4; 84/5. CHESTERFIELD 83/4; 93/4; 98/9; 99/00; 04/5. CREWE 83/4; 84/5; 85/6; 86/7; 92/3; 93/4. DARLINGTON 87/8. DONCASTER 76/7; 88/9; 92/3; 93/4; 94/5; 95/6; 96/7. EXETER 88/9; 94/5. FULHAM 88/9 (FAC). GILLINGHAM 75/6; 79/80; 80/1, 80/1 (LC); 81/2 (LC); 86/7, 86/7 (FRT). GRIMSBY 88/9; 89/90 ('last' season £1). HALIFAX 88/9. HARTLEPOOL 81/2; 96/7. HEREFORD 74/5; 81/2; 84/5; 85/6; 86/7. HUDDERSFIELD 96/7 (LC). HULL 78/9; 80/1; 82/3; 96/7; 97/8. LINCOLN 77/8; 93/4; 98/9. MANSFIELD 78/9; 93/4; 94/5; 95/6; 02/3. NEWPORT 80/1 £1.20. NORTHAMPTON 84/5; 88/9 (LC). NORWICH 07/8. NOTTS COUNTY 98/9; 99/0; 00/1; 01/2; 02/3; 03/4. OXFORD 79/80; 80/1; 99/0. PETERBORO 69/70 £1; 71/2; 81/2; 82/3; 83/4; 85/6; 86/7, 86/7 (LC); 87/8; 88/9; 95/6 (Auto) £1; 97/8; 00/1; 01/2; 02/3 £1; 03/4; 04/5. PLYMOUTH 77/8; 80/1; 87/8 (FAC). PORT VALE 81/2; 82/3; 84/5; 02/3; 05/6. READING 66/7 £1.50; 67/8 £1.50; 71/2; 79/80; 80/1. ROCHDALE 87/8; 96/7. ROTHERHAM 75/6; 80/1. SCUNTHORPE 70/1; 85/6; 92/3; 93/4; 94/5; 95/6. SHEFF UNITED 79/80; 80/1; 00/1 (LC). SHEFF WED 75/6. SHREWSBURY 92/3; 93/4; 05/6 (FAC). SOUTHEND 68/9 £1.50; 75/6; 78/9; 79/80; 85/6; 86/7; 89/90 ('last' season); 03/4 (LDV Southern final). STOCKPORT 73/4. SWANSEA 88/9 (FAC); 96/7; 97/8. SWINDON 79/80; 84/5. TORQUAY 67/8 £1.50, 67/8 (FAC) £1.50; 81/2; 85/6; 89/90 ('last' season); 92/3; 94/5; 96/7; 97/8. TRANMERE 87/8. WALSALL 74/5; 75/6; 80/1; 92/3; 94/5; 00/1. WATFORD 67/8 £1.50; 78/9; 82/3 (LT). WIGAN 93/4. WIMBLEDON 79/80. WREXHAM 77/8; 93/4 (Auto). YORK 69/70 £1.25; 82/3 £1; 88/9 £1; 89/90 ('last' season £1); 98/9 £1. FINAL – 96/7 v Carlisle (Autoglass final at Wembley) £2.50. FRIENDLIES & TESTIMONIALS (Aways) – at Raith Rovers 89/90 £1.50; Southend 03/4. v NON LEAGUE (Aways) – at Leatherhead 78/9 (FAC) £1; at Stafford 87/8; at Wivenhoe 88/9; at Woking 08/9. NEUTRAL VENUES – 77/8 v Bournemouth (FAC at Watford); 61/2 v Peterborough (FAC at Norwich) £1.50.